The Portsdown 2019 DATV system has been designed to provide an easy way to “get on air” with Digital ATV at a relatively low cost covering all of the commonly used modes, so enabling it to be used on ATV repeaters but also for RB-TV DX working. The 2019 Portsdown is significantly different to previous versions in that the system no longer uses the custom built Filter Modulator card which has been replaced with an off-the-shelf LimeSDR Mini. Overall the LimeSDR Mini is similar in cost to the F-M board as you no longer need an ADF4351 LO module and an LO filter PCB. The LimeSDR Mini plugs in to the Raspberry Pi USB port, preferably via a powered USB hub and produces an RF output from ~ 30MHz to 3.5GHz. This guide is in a number of sections which cover detailed descriptions for hardware and software, how to build and configure the system, some advanced features and an FAQ. Portsdown 2018 has been superseded by Portsdown 2019 but there is NO intention to discontinue support of the 2018 model. Portsdown 2019 is recommended for all new builds but if you would still like an F-M board, we suggest you post on the wanted section of the forum - https://forum.batc.org.uk/viewforum.php?f=14 - or blank PCBs for home construction are still available here - BATC shop item 10. All the wiki information on Portsdown 2018 is still available here. The Portsdown 2019 will accept video input from a composite video source, the Pi camera, some WebCams or integrated stored test cards. It will then encode these as MPEG-2 or H264 with stereo audio. Frequency range - Using a LimeSDR Mini it will transmit DATV on frequencies between 30 MHz and 3.5 GHz. Power output - Typical power output varies with frequency and is plotted here: LimeSDR_Mini_Output_Power_Levels. The power output level can be increased and leveled off the frequency range by using a Portsdown 8 way RF switch on the output. Transmission modes - DVB-S and DVB-S2 modes are available from the LimeSDR Mini, with QPSK, 8PSK, 16APSK and 32APSK. Symbol rate - Due to the limited processing power and USB capability of the Rpi, symbol rates are generally limited to 1Ms and below (down to 66 KS), but some H264 modes will work at 2MS. Note the LimeSDR Mini hardware is capable of higher symbol rates when used with DATVExpress software. Here is the latest system diagram. Note that only one of the displays is required; either the 3.5 inch or 7 inch; the digital variable attenuator is only required if you want fine (<3 dB steps) control over your PA drive levels. The Lime Gain control on the Portsdown can be used to set the coarse output level. The Portsdown 2019 uses the majority of the 2018 Portsdown hardware. 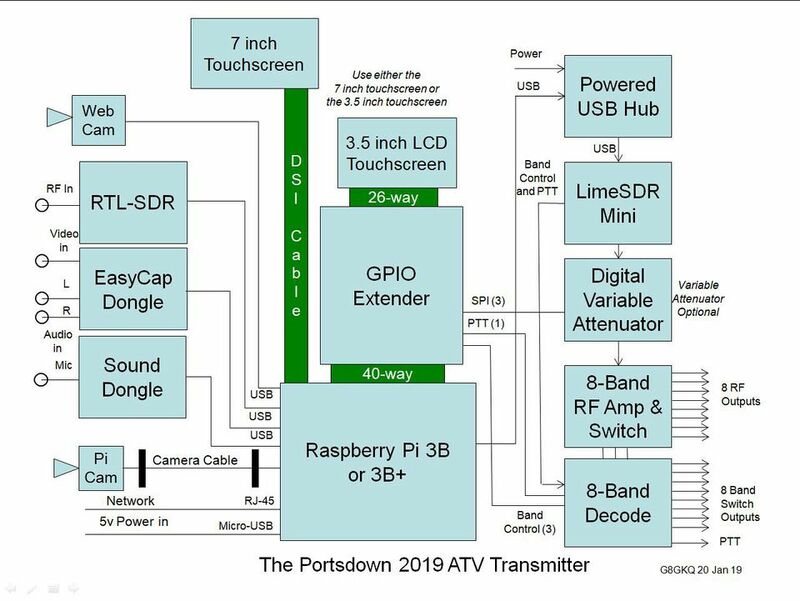 Portsdown2019 hardware Detailed description of the Portsdown 2019 hardware and a shopping list of what you need to buy and where to buy it. Assembling your Portsdown How to put all the hardware together - you need to read this! Portsdown Displays Advice on what display to use with your Portsdown transmitter. The Portsdown 2019 uses the same software as later versions of the Portsdown 2018 system which is known as Portsdown 2018/2019 and is based on the Raspberry Pi's Raspbian Stretch operating system. Portsdown 2018/2019 Stretch Software The latest and greatest software for the Portsdown and how to get a programmed SD card. Updating your Portsdown Software How to update your Portsdown software to the latest version, with suggestions for troubleshooting updates. Once you have completed your hardware build or have bought the RPi, display and LimeSDR Mini and just "want to try it", connect up the hardware and insert an pre-programmed SD card into SD slot on the RPi. A new or upgraded SD Card (version 201902070 or later) will also work out of the box with the either screen and is ready to use with no initial configuration required. Connect the touchscreen (being very careful to align the pins on the Wavesahre correctly) and apply power to the RPi and the user interface menu 1 should appear. The Lime configuration options are described here: Using_LimeSDR_with_Portsdown. Once the system is configured, you can control the Portsdown transmitter in one of 2 modes: by the use of the touchscreen or through the console using a second computer. Console mode Use this mode to configure advanced settings such as WiFi or non-standard screens. Still Capture from Composite Video Input How to capture still images from a Composite Video input. Hardware-only Transmit Switching How to use the Portsdown without a Touchscreen or computer. Note that the BATC core team do not regularly visit Facebook pages - time is just too short to monitor everything and it's not easy to follow threads on Facebook. If you need a question answered please post on the BATC forums first. This page was last modified on 16 April 2019, at 21:32.